The Morrisons Price Crunch is on. Spend a little and get a lot. Only in the Mirror on Sunday October 2nd 2011. 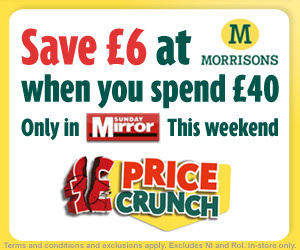 Morrisons and the Sunday Mirror are offering a Voucher to save you £6 off your shopping when you spend £40 instore. The Voucher will be in this Sundays Mirror Paper which only costs £1, so you save yourself £5 off £40 spend which works out at more than 10% off your food bill.